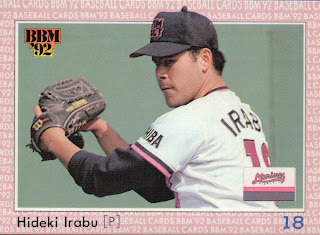 Stunning news tonight - former Lotte and Hanshin pitcher Hideki Irabu was found dead at his home in Los Angeles. He apparently committed suicide. I have felt that I have neglected Hideki Matsui on my blog over the years. I think that this has mostly been due to the fact that he first played for my least favorite NPB team, then for my least favorite MLB team, before moving last year to a team I'm not particularly fond of (the Angels) until finally this year he ended up with a team that I like (the A's). The latest Prestige Collectibles Auction is running until July 26. Details are here. Another recent eBay pickup for me was this 1997 BBM box. The box contained 30 packs of 10 cards each, so there were 300 cards in all. The 1997 set only had two insert sets (and no memorabilia cards) so I wasn't terribly surprised that I only got four insert cards in the box (two Rivals cards of Motoyuki Akahari and Yasuyuki Kawamoto and two Best 9 cards of Luis Lopez and Takeshi Yamasaki). 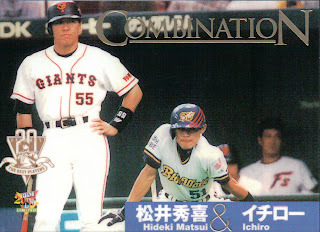 There were also two subsets in the regular set that were short printed - a nine card "Nostalgic Stars" subset and a nine card "KK" subset that celebrated the reunion of high school teammates Masumi Kuwata and Kazuhiro Kiyohara on the Giants. I got two of the "KK" cards in the box but no "Nostalgic Stars" cards. So that leaves 294 "regular" cards. I have to say that I was expecting a lot of doubles in the box. While opening the packs, I noticed that two were nearly identical. Not only did the two packs share six cards but they did it in almost the same sequence of cards. 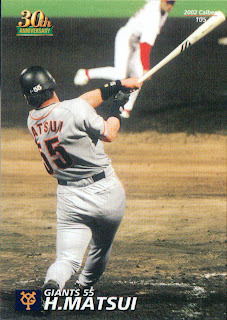 The top card in each pack was Yasuyuki Yamauchi, followed by Hiromitsu Ochiai and Jason Thompson. 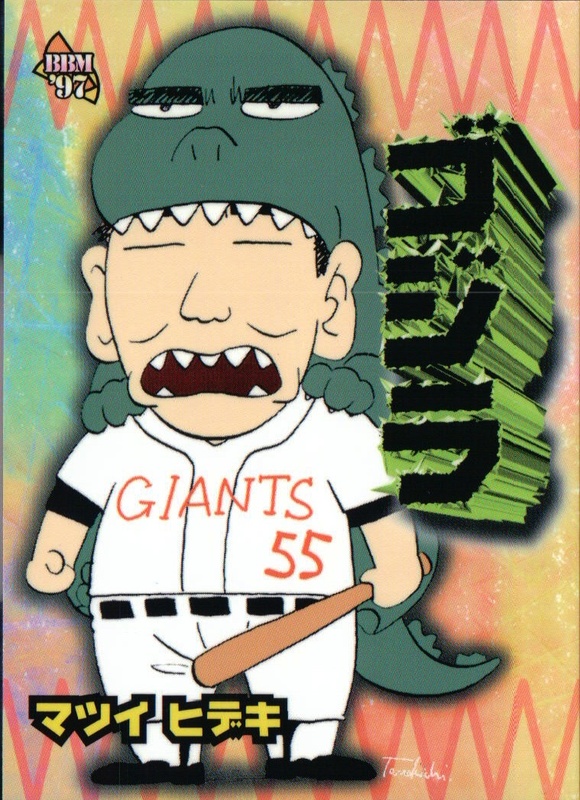 The next three cards were not the same between the two packs, but then the next two in both packs were Yu Sugimoto and a Troy Neel leader card. Then once again the next card was different between the two packs but the final card in each was a Hawks checklist. Despite this, however, I was surprised to discover that the box had only 37 doubles in it, meaning that there were 257 unique "regular" cards in the box. Even better than the box of 2000 BBM I opened last month. (And even better for me - 120 of them were ones that I didn't already have). 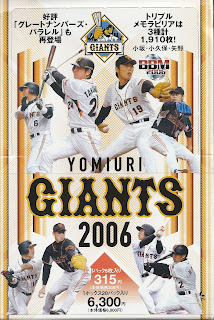 The one things that I came away with after going through these cards is how many big name rookie cards are in this set. Yoshitomo Tani, Michihiro Ogasawara, Kazuhiro Wada, Tadahito Iguchi, Nobuhiko Matsunaka, Hiroki Kuroda, Akinori Iwamura and Makoto Imaoka all have rookie cards in the set, along with future US imports Shinji Mori, Akinori Ohtsuka, Kats Maeda and Yusaka Iriki. 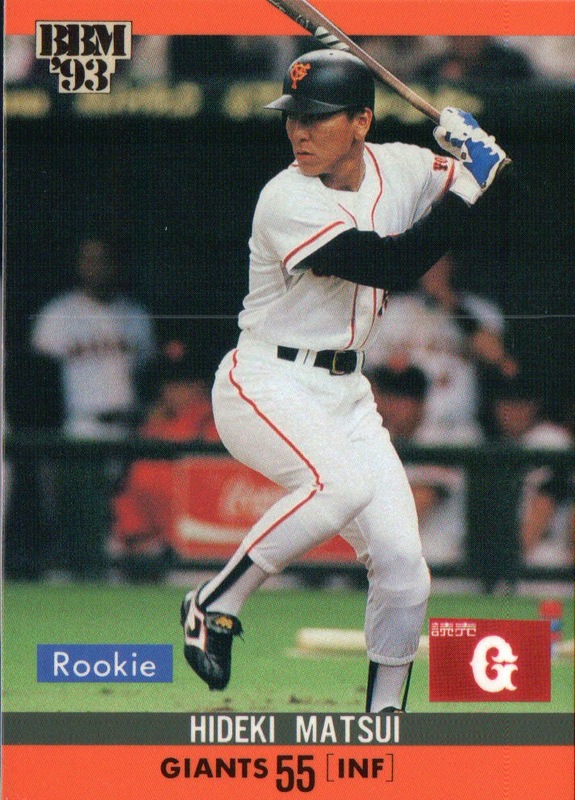 I haven't studied this at all so I don't know but it seems like this might be one of the more impressive rookie crops (and that's not even taking into account anyone who's first card is in the set but is not labelled "Rookie". 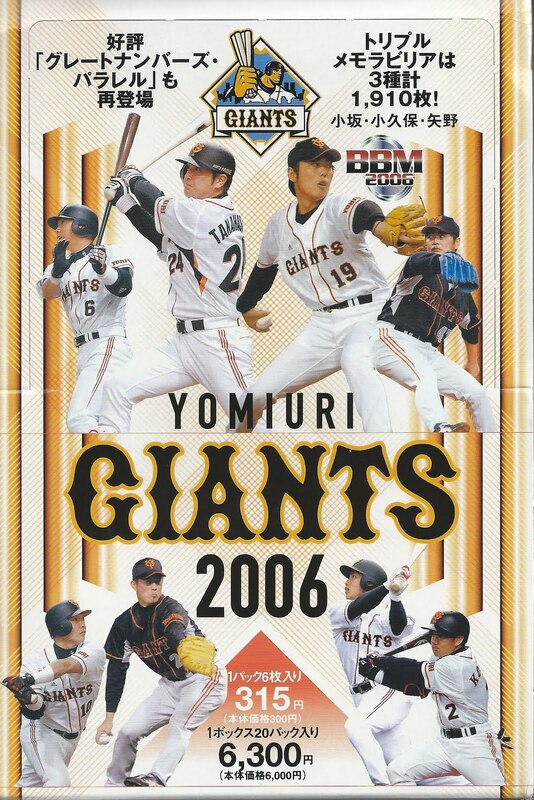 Been a little slow in getting to these but over the last couple weeks BBM has announced a couple new sets including the final three team sets for 2011. 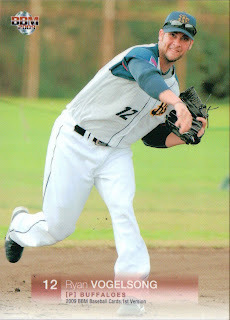 The Orix Buffaloes team set may already be out as it was scheduled to be released in early July. It's a packed based set with 99 "regular" cards plus a nine card insert set and various autographed or memorabilia cards. 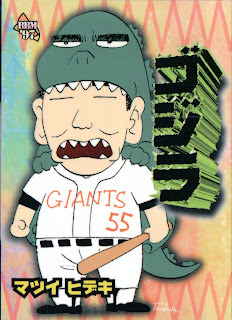 There are 72 cards for the players and manager, a checklist card, a two card "KOREAN TREASURE" subset (which I assume features Chan Ho Park and Seung Yeop Lee), a three card "Trio Relief" subset, a three card subset that translates as "First Thing Cards" (no idea what this is), a nine card puzzle subset and a nine card subset called "BACK TO THE HANKYU BRAVES" which I'm guessing either show the current players in their Hankyu throwback uniforms from earlier this season or show OB players from the Braves. The insert set is called "THE GREAT HORNS" - since it's nine cards I would assume it's a Best 9 of some sort but I don't know if it features current or OB players. 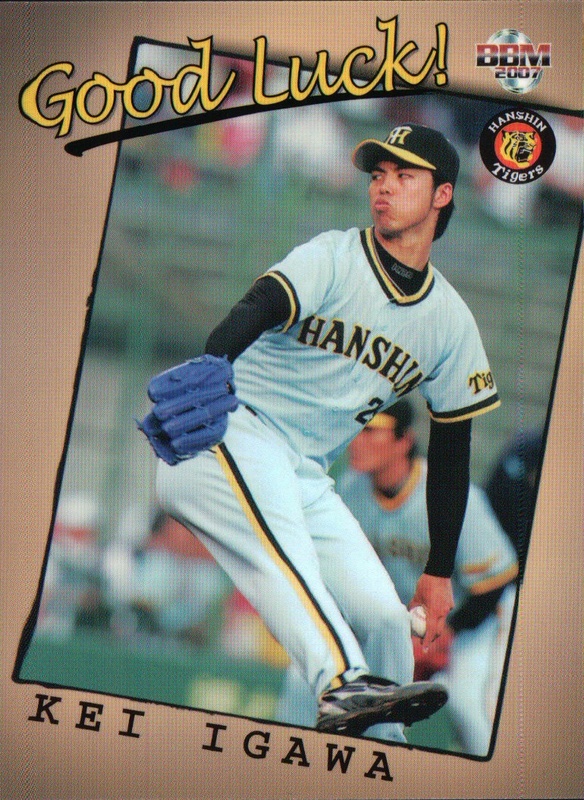 The Fukuoka Softbank Hawks team set will be released on July 28. It's also a 99 card pack based set that features a whopping 87 cards for the players, coaches and manager, three cards for a "Promising Young Player" subset, eight "Combination Cards" and a checklist card. 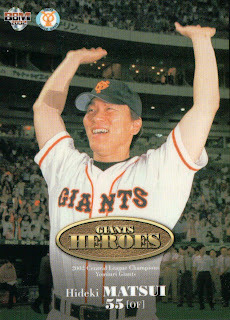 There's a nine card insert set called "HAWKS HEROES" and a bunch of memorabilia cards. There's also a couple different autograph parallel sets for the player cards (I think they're facsimile autographs but there may be some real ones as well). Not sure if this has been done by BBM for a team set before, but they are issuing this set in "Light Packs" (6 cards instead of 7) as well. These packs contain the same regular cards (with only one possible parallel autograph set) but no "HAWKS HEROES" insert cards and only a single memorabilia card (Seiichi Uchikawa jersey) available. I think the Uchikawa jersey card is only available in the "Light Packs" (which I think are only available in Kyushu). 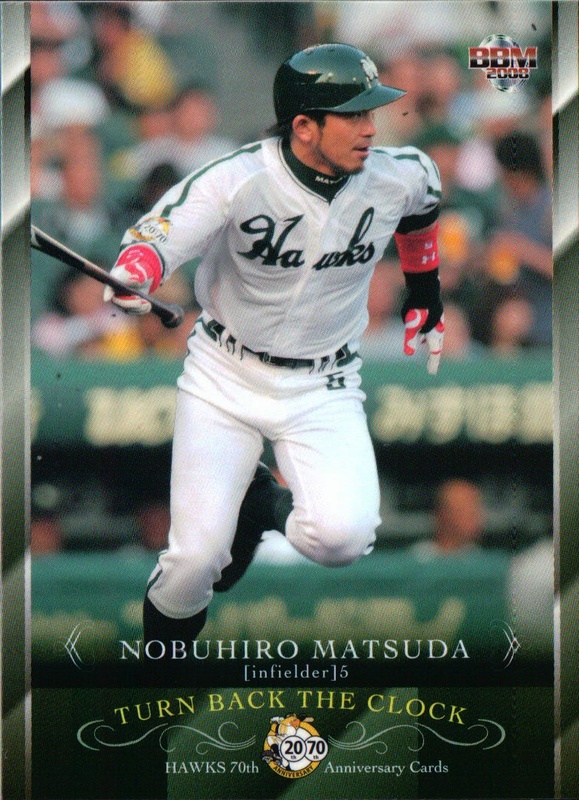 The Hokkaido Nippon Ham Fighters team set is listed as being released in late July. Like the others, it is a 99 card pack based set featuring 70 cards for the players and manager, two checklist cards, six cards for "2010 Title Holders", a three card (!) subset commemorating Yuki Saitoh's first career victory, nine "Combination Cards" and a nine card subset called "Fighters Emotion". There's a nine card insert set called "Shine Of Gold", a couple memorabilia cards (jersey cards of Yu Darvish and Ryo Sakakibara both singly and in combination - amazingly no Yuki Saitoh cards!) and autograph cards. 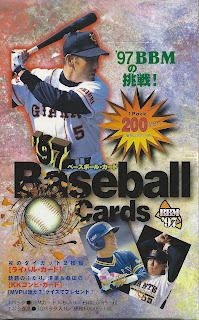 BBM is also releasing a box set for the Tohoku Rakuten Golden Eagles in late July. This set contains 28 cards - 18 "regular" cards, 9 "subset" cards (that's what the website says - no further details) and either an autographed card or a memorabilia card. 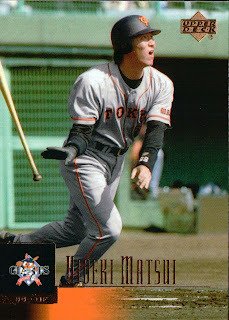 In addition to what's on BBM's website, AmiAmi has listings for this year's Touch The Game set and a new OB set commemorating the 20th Anniversary of the Lotte Orions moving from Kawasaki to Chiba and becoming the Chiba Lotte Marines. 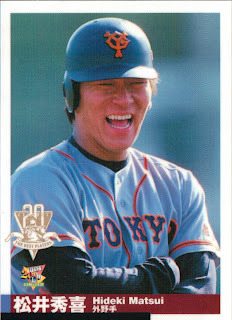 Just for the record - I do not believe that any cards of Soriano with the Carp exist - he only appeared in nine games with them in 1997. And speaking of Cecil Fielder, how weird is it that he hasn't appeared in any OB sets? You'd have thought he'd have made one of the two Tiger Anniversary sets that have come out in the past six years. 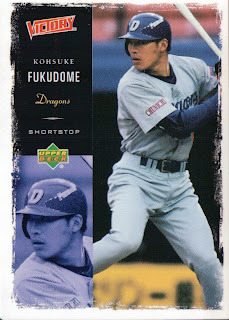 I've mentioned before that BBM seems to be going out of their way this season to showcase Yuki Saitoh of the Fighters. There's the "Platinum Age" set featuring players born in 1988, various insert and memorabilia sets with the 1st and 2nd Version sets and the Fighters Mega Energy set. This week, I picked up yet another set that BBM had done that features Yu-Chan: the Future Icon boxed set. I haven't seen anything about this set on BBM's website and the box is labelled "Kamagaya Stadium Edition" which makes we wonder if it was either a stadium giveaway or simple something only available for sale at the Fighter's ni-gun team's ballpark in Kamagaya. The set contains 18 cards. 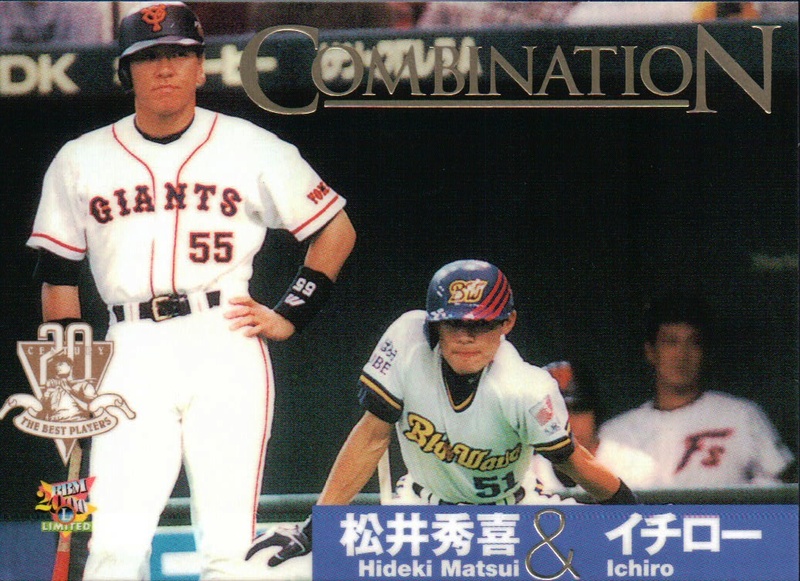 The fronts of cards 1-16 are essentially reprints of cards of various Fighter rookies from this season's Rookie Edition, "Platinum Age" and 1st Version sets, with a "Future Icon" logo added. (The Rookie Edition subset includes all six Fighter cards from the original set.) Card 17 (of Yuki Saitoh) does not reprint an existing card, so it's labelled "Original design card". Card 18 is for the ni-gun Fighter's mascot Cubby. set have their Rookie Edition and 1st Version reprints in the set: Haruki Nishikawa, Masahiro Inui, Yodai Enoshita, Yuya Taniguchi and Masaru Saitoh. 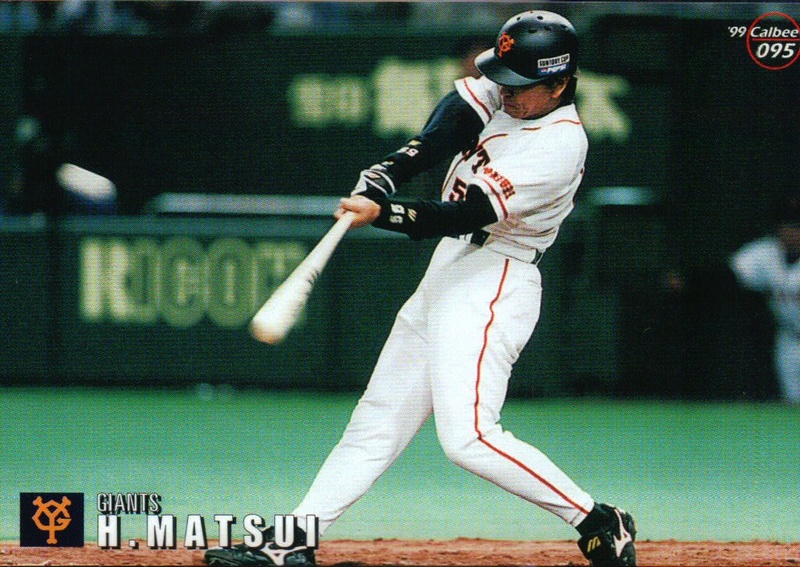 The other player is Mitsuo Yoshikawa, who's Platinum Age and Platinum Age Printed Autographed Card are reproduced. I picked this set up via an avenue that I had not previous tried before - the Rakuten Global Market. 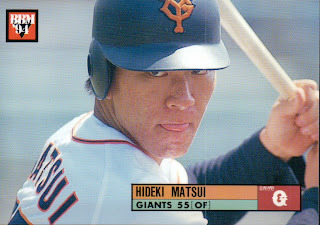 I was browsing through their baseball cards, saw the set and decided to see how easy it was to order. The set was around 1100 yen and shipping was 1200, so the total ended up being a little shy of $30. I was amazed, however, at how fast I got the set. I ordered the set this past Monday afternoon (Eastern US time, middle of the night in Japan) and I got it yesterday (Thursday)! Wow! The only thing I was uncomfortable about was that the confirmation emails I got were in Japanese. I ran them through Google Translate to see if there was anything they were actually asking me or if it was just automated messages about the order. I was pretty sure it was the latter but I wasn't completely sure until the cards showed up. 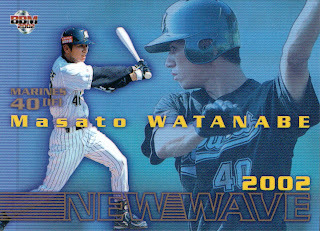 I'm definitely going to order through them again, possibly get some of this year's Calbee cards. Update: just looked again at the listing for the set at Rakuten. I think it's saying that there's a possibility of getting an autographed (not sure if it's a real autograph or a printed one) version of cards 17 & 18 - Yuki Saitoh or Cubby. 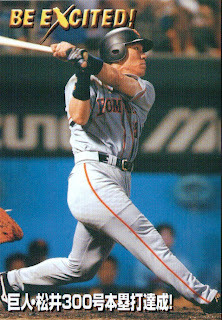 (Man, that's a good news-bad new situation: the good news is that you got a really rare autographed card; the bad news is it's the mascot...) More importantly, it looks like the set was supposed to be sold at Kamagaya on March 16 but I'm pretty sure than since that was five days after the earthquake, that game was never played. 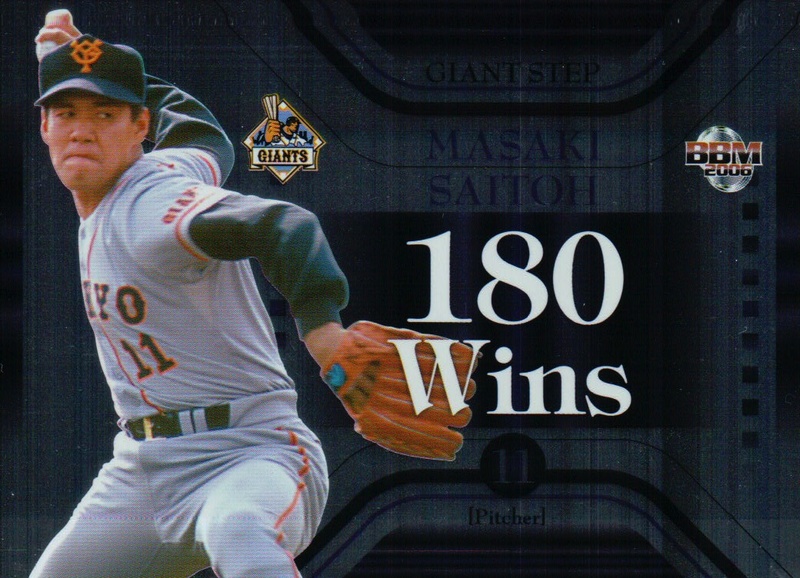 The insert cards that I got were all from the "Giant Step" (Engel calls it "Great Numbers") set - each card shows a Giants player and their career total (as of 2005 obviously) in some category. For example, Kimiyasu Kudoh's card shows he has 215 wins, Hiroki Kokubo's card shows 313 home runs, etc. It includes retired players as well, such as Tatsunori Hara (382 home runs), although none of the more major retired Giants - Oh, Nagashima, Harimoto, Kaneda, etc. One of the six insert cards I got was actually from a parallel issue to the "Giants Steps" set - for each of the inserts there is a parallel issue that is serially numbered up to the number on the card. So there's 215 Kudoh parallel cards numbered 1 to 215. 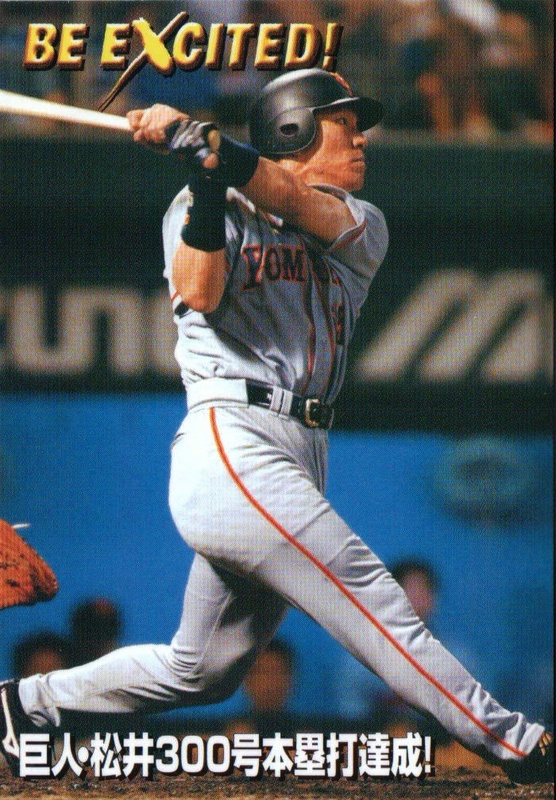 This is kind of like those stupid Topps Home Run inserts for (I think) Mantle and Bonds where they just re-used the same picture for each card and changed the number. I mentioned earlier that I had opened another box for this set previously. 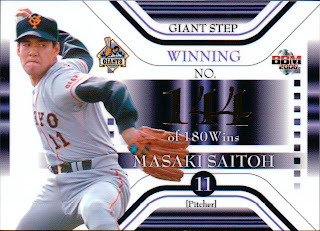 The breakdown of insert cards to regular cards was the same - 5 "Giant Step" cards and 1 parallel issue "Giant Step" card.